As a Peer Support volunteer you are integral to the work of Reclaim Your Curves. Our key point of difference is that we are at the ready to meet the needs of women in a variety of ways, and without you it would be impossible. Peer Support volunteers work every day connecting with women across Australia doing what women do best, sharing their stories with one another. You are a welcome and very valuable part of Reclaim Your Curves. 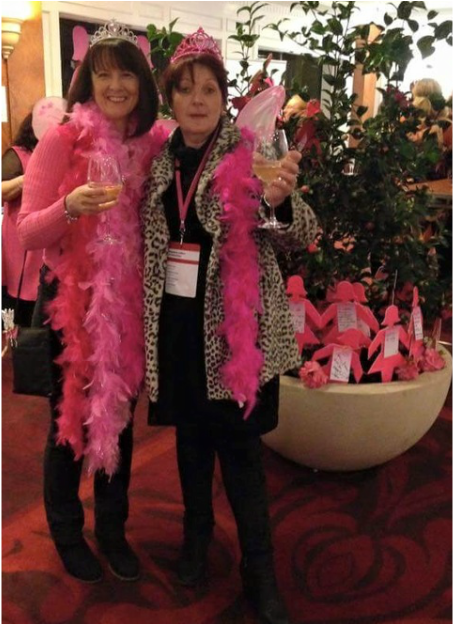 Two of our committed Peer Support Volunteers Paula and Chris letting their hair down at the BCNA Summit in 2015. RYC manages two online groups. Hosted on the BCNA Online Network, Choosing Breast Reconstruction private group started in 2013 and the Reclaim Your Curves Closed Facebook group formed in 2015. There are 6 facilitators across these groups who are on a weekly roster to welcome and support members into the groups and to keep an eye on things to ensure the groups run smoothly. Some IT skills are needed to become an online facilitator, but if this appeals you we are always happy to bring new facilitators onboard. When you have found your suitable location to hold your events and settled on several dates we will create a webpage and commence promotion of your lunches. You are encouraged to use the Lunch Promotion Flyer below to promote your event in suitable locations such as hospital waiting rooms, GP waiting rooms, Community notice boards etc. Its a good idea to ask permission before leaving the information. Ask your members who they would like to have attend their group. Below is the BCNA Member Group Registration Form. If you are running a face to face group please complete this form and send it to BCNA using the email address included. The form is partially completed with the information about RYC. Please complete your details and the details of where your lunches will be held. Your Peer Support Group will then be listed on the BCNA website as an official Member Group. BCNA will send you a kit of information to use at the gatherings. Women are able to contact RYC through the website, by email or by phone. When a woman contacts us for Peer Support we will take her details and pass them on to the most appropriate Peer Support Member. Peer Support Members will be selected based on the specific request of the woman seeking support and more than one Peer Support Member may be given her details so she hears a range of experiences. Please make contact within week of receiving the request to ensure the woman doesn’t feel she has been forgotten. We all know what it’s like to reach out for support when you need it and then be left waiting. The level of details you share is a personal decision. Listen to the woman to hear her concerns and questions and respond accordingly. Stay on point and set a time limit, get to the pain points and issues. Ask if she would like to have you contact her again at a later date for additional support. Where appropriate refer her to RYC website resources and/or RYC online communities which can be accessed via our website.